Durga Puja is a Hindu festival which is also known as Durgotsava. It is widely celebrated by Bengali people in Kolkata, West Bengal, Bihar, Assam and Bangladesh. The festival is celebrated in the month September or October. Firstly, the goddess Durga has three eyes, much better for us to see the Puja. The third eyes of Goddess Durga at the forehead are said to move 360 degrees, keeping an eye on every aspect of the life. The amazing Pujas are conducted at Maddox Square, Mundiali and Jodhpur Park. Mundiali is famous for its glitz whereas Maddox square is famous for its fashion and Jodhpur Park is famous for its ingenuity. There are hundreds of Pandals, small, big and massive. Ballygunge has a pandal like a pagoda. Children of Kolkata seem to enjoy the most during this season. The goddess has a conch that blasts out an “Om”. The most famous delicacies of this Puja are said to be Malpoas, Kosha Mangsho or meaty adda. The festival has tradition drummers known as Dhakis that play a consistent rhythm throughout the festival. The rhythmic beats of the Dhakis is simply engaging and no Durga Puja is said to be complete without them. The best beats are played at the Gol park which makes everyone sway in the tunes and dance from children to the eldest. The goddess Durga holds a trishul or a trident. One can see hundreds and thousands visiting these places where Pujas are conducted, each on praying and offering. Colours of reds, oranges and white are seen throughout Kolkata. Visitors come with family and cameras to these places either as a site to visit, tourism or pilgrimage. One can keep water bottles or biscuit packets while visiting these great places. While you are stuck in traffic jams between pandals, these eatables can give you company. It is also necessary for one to keep an eye of thieves and other pick pocketers while you’re surrounded by this massive crowd. Goddess Durga also owns a sword. The sword symbolizes sharp intelligence. One will definitely drown in the beauty of the statues of Goddess Durga and in the temples in which she resides. Puja afternoons and early mornings are the best timings for sight seeings. Little, back-alley pandals seem to be much more youth friendly. One will definitely be carried away by the lake gardens and the peacock marquee it holds inside.The whole Kolkata is widespread with loud music playing day and night. The fern road pandals have illuminated and animated Animals inside. These Pujas are very environment friendly containing ushers that help you throughout. Goddess Durga also holds a bow and an arrow. They are meant to be the symbols of energy and extreme power. The sculptors of Kumartuli engage together with Chandannagar’s the masters of illumination. There are pandal-makers from all over Kolkata who are well admired and appreciated. The Devi also holds a lightning thunderbolt. These events have such crowds where children sit on their parent’s shoulders to watch the ceremony. Goddess Lakshmi has an owl for the sake of night vision. The goddess Durga holds an inextinguishable flame that signifies knowledge and intelligence. She also has a fierce lion by her side. The mains of this Puja include dancing lights, inspiring pandals, delicious festive foods, massive crowds, majestic idols that Kolkata serves you with during the time of Durga Puja. The jewellery of “Saaj” of the idol of goddess Durga is made from local plants named Shola. Since it is imported from overseas by post or daak in Hindi, the ornamentation also came to be known as Daaker saaj. The idols of goddess Durga are decorated with fine gold ornaments and vibrant colours paints. God Shiva is the husband of Goddess Durga. He is also revered to during this festival. It is known that royal and wealthy families all around India have been sponsoring Durga Pujas all around India. 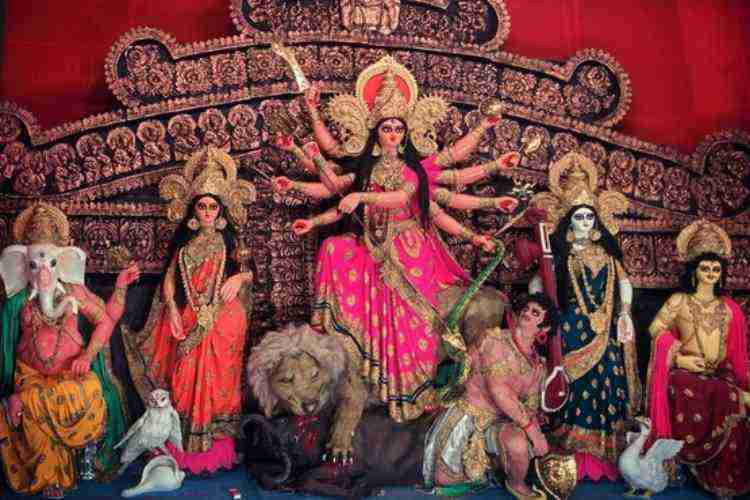 Durga Puja is a ten days festival. Usually the last five days are given as public holidays in some places. Shops and restaurants are open throughout the night. Fairs are held at various places where children love to go. For private Durga Pujas, families offer up areas of theirs homes known as Thakur Dalan. Inside this idols are placed by the potters, the statues are dressed with vivid coloured Sarees and decorated with gold and silver ornaments. Traditionally, married daughters are said to return to their parents or go to their “Maayka” in order to celebrate Durga Puja with her parents as a symbol of Goddess Durga who is said to return home to her parents for the festival. The last day also known as the day of Vijayadashami, the statues of the idol Durga are taken for the process of immersion. The idols are immersed in holy rivers, lakes and other water bodies. This process is conducted along with dancing and singing. One can also observe colourful fireworks up in the sky. Other major Indian cities like Delhi, Mumbai, Pune, and Goa also enjoy celebrating the homecoming of the Goddess Durga and celebrate with families. In Nepal and Bhutan, Durga Puja is called Dashain. It is said to be the longest festival in Nepal. All throughout the place “Shakti” is worshipped. In the USA, families come together to celebrate this famous festival in small or at times large gatherings. Even in Europe the festival is widespread. Although in such areas, pandals are not constructed, but statues of goddess Durga are imported from India.